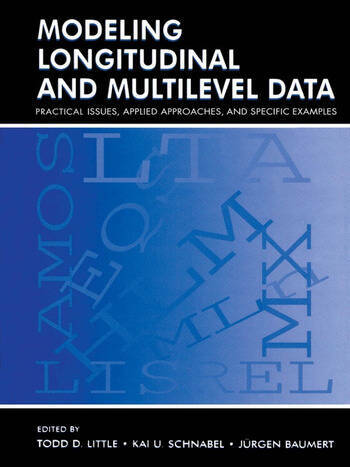 This book focuses on the practical issues and approaches to handling longitudinal and multilevel data. All data sets and the corresponding command files are available via the Web. The working examples are available in the four major SEM packages--LISREL, EQS, MX, and AMOS--and two Multi-level packages--HLM and MLn. All equations and figural conventions are standardized across each contribution. The material is accessible to practicing researchers and students. Users can compare and contrast various analytic approaches to longitudinal and multiple-group data including SEM, Multi-level, LTA, and standard GLM techniques. Ideal for graduate students and practicing researchers in social and behavioral sciences. Contents: Preface. K.U. Schnabel, T.D. Little, J. Baumert, Modeling Longitudinal and Multilevel Data. J.J. Hox, Multilevel Analyses of Grouped and Longitudinal Data. C-P. Chou, P.M. Bentler, M.A. Pentz, A Two-Stage Approach to Multilevel Structural Equation Models: Application to Longitudinal Data. R.C. MacCallum, C. Kim, Modeling Multivariate Change. J.J. McArdle, R.Q. Bell, An Introduction to Latent Growth Models for Developmental Data Analysis. R. Steyer, I. Partchev, M.J. Shanahan, Modeling True Intraindividual Change in Structural Equation Models: The Case of Poverty and Children's Psychosocial Adjustment. T. Raykov, Modeling Simultaneously Individual and Group Patterns of Ability Growth or Decline. L.M. Collins, S.L. Hyatt, J.W. Graham, Latent Transition Analysis as a Way of Testing Models of Stage-Sequential Change in Longitudinal Data. K.F. Widaman, Testing Cross-Group and Cross-Time Constraints on Parameters Using the General Linear Model. T.D. Little, U. Lindenberger, H. Maier, Selectivity and Generalizability in Longitudinal Research: On the Effects of Continuers and Dropouts. J.W. Graham, S.M. Hofer, Multiple Imputation in Multivariate Research. W. Wothke, Longitudinal and Multigroup Modeling With Missing Data. J.L. Arbuckle, Customizing Longitudinal and Multiple-Group Structural Modeling Procedures. M.C. Neale, Individual Fit, Heterogeneity, and Missing Data in Multigroup Structural Equation Modeling. "This book is well written in an accessible style, and it will clearly appeal to researchers with a social and psychological interest." "Investigators conducting longitudinal research should find this book useful." "...I consider this book to be an extremely useful resource providing a great deal of depth in the topics of multilevel and longitudinal modeling. Because many of the topics included in this book are cutting-edge methodological advances, the book will be most appreciated by researchers who already have a good grasp of multilevel and longitudinal approaches. For this group of individuals, the book will be a very valuable resource.